Cats love flower beds. They love to roll in the dirt, rub against the flowers, sometimes eat the flowers and go potty in the dirt. 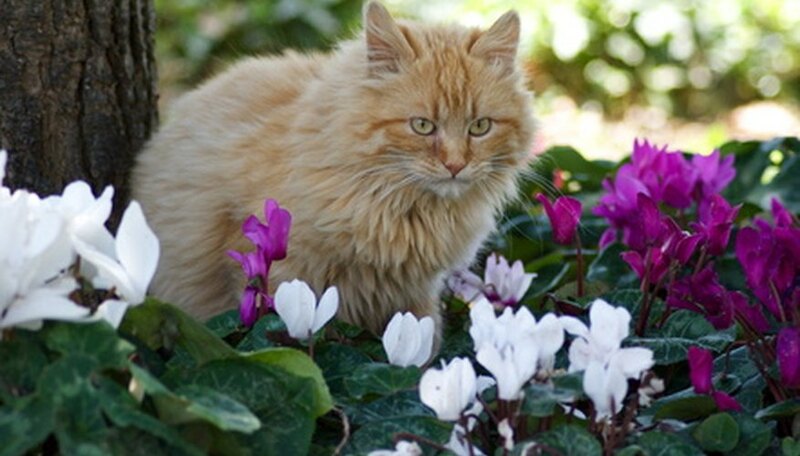 Most homeowners get upset when the neighbor's cat does their duty in their flower bed. Responsible cat owners keep their cats indoors, but not all cat owners are responsible. There are many techniques for keeping cats out your flower beds, but it may take some trial and error to find the right one. Moisten cotton balls with lemon-oil furniture polish and scatter them through the flowerbed. Cats hate the smell of citrus. Put one next to the base of each plant. According to Dr. Myles H. Bader, a Preventative Care Practitioner, it is harmless to the cat. This technique is suggested for houseplants, but there's no reason it shouldn't work in the flowerbed. Plant a garden for the cat, but set it away from your vegetable and flower gardens. Find a place in the yard to give to the cat. Plant cat nip, cat mint and a little grass. The cat will enjoy lounging in it's own garden and leave yours alone. Put in a water feature for the cat, such as a small fountain or pond, to distract it away from the flower beds. Cats love gurgling water and will find the pond or fountain more attractive than your flower bed. You are probably thinking, That's an awfully big expense for the neighbor's cat. You and the family, however, will find listening and watching water gurgle very relaxing. Install an electronic cat deterrent. A motion sensor on these devices sets off an alarm that's only heard by the cat. There are different models, and they all run off a battery. The range of sound depends on the model purchased, and some also produce a flashing light. The cat will quickly get the message that this isn't the flowerbed to visit. Call your hairdresser and ask her to save a bag of hair clippings for your garden. Scatter the hair in the flowerbed. Cats will smell a stranger of the human kind and stay far away, because they're afraid of strangers. If you are a cat owner, consider keeping your cat indoors. It keeps your cat safe from injury, and it shows consideration for your neighbors. Never put out poison for a cat or do anything else to harm a pet. It's a crime and many people have gone to jail for cruelty to animals.